Just wanted to share it with you. It is made in Flash 9 years ago and includes dozens of interviews with veterans, newsreels, animated schemes of battles and much more. 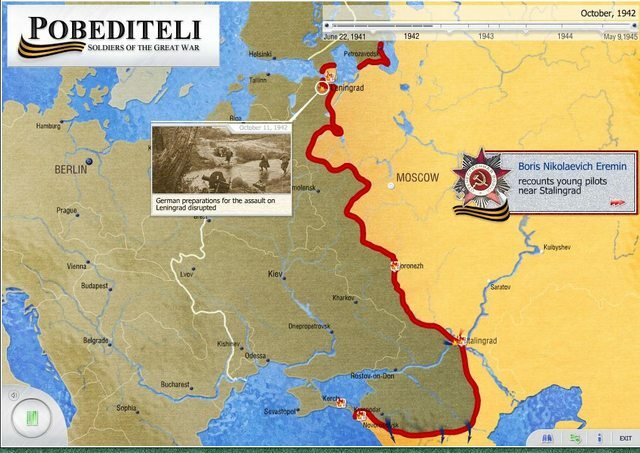 Though it's a bit Soviet biased, but anyway it still provides a basical understanding of how Eastern Front evolved. Share similar projects you know here. Cool, I knew about one of these but it was the American Civil War, I didn't know they had WWII ones also, this is neat! I watched whole presentation, it indeed shows the Russian point of view only. I wouldn't treat it as a history lesson, nevertheless it's an interesting form of interactive demonstration.